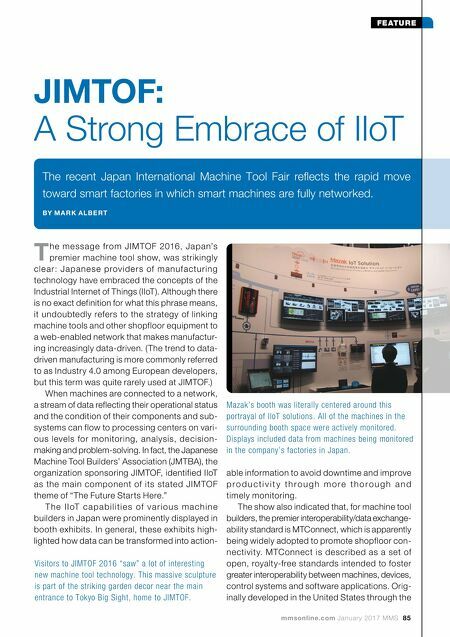 mmsonline.com January 2017 MMS 85 FEATURE T he message from JIMTOF 2016, Japan's premier machine tool show, was strikingly clear: Japanese providers of manufacturing technology have embraced the concepts of the Industrial Internet of Things (IIoT). Although there is no exact definition for what this phrase means, it undoubtedly refers to the strategy of linking machine tools and other shopfloor equipment to a web-enabled network that makes manufactur- ing increasingly data-driven. (The trend to data- driven manufacturing is more commonly referred to as Industry 4.0 among European developers, but this term was quite rarely used at JIMTOF.) When machines are connected to a network, a stream of data reflecting their operational status and the condition of their components and sub- systems can flow to processing centers on vari- ous levels for monitoring, analysis, decision- making and problem-solving. In fact, the Japanese Machine Tool Builders' Association (JMTBA), the organization sponsoring JIMTOF, identified IIoT as the main component of its stated JIMTOF theme of "The Future Starts Here." T h e I I oT c a p a b i l i ti e s of va r i o u s m a c h i n e builders in Japan were prominently displayed in booth exhibits. In general, these exhibits high- lighted how data can be transformed into action- JIMTOF: A Strong Embrace of IIoT The recent Japan International Machine Tool Fair reflects the rapid move toward smart factories in which smart machines are fully networked. BY M A R K A LB E RT Visitors to JIMTOF 2016 "saw" a lot of interesting new machine tool technology. 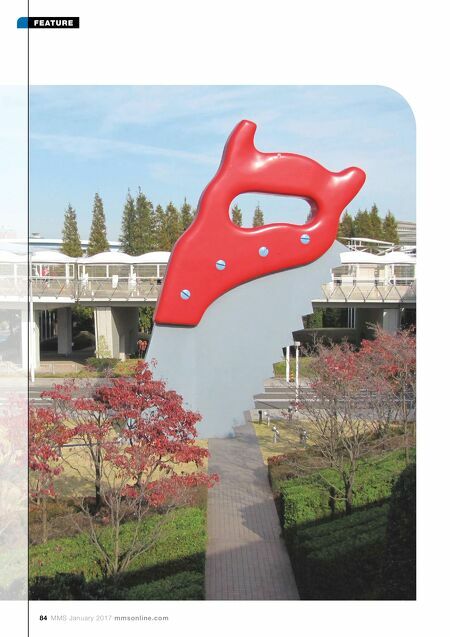 This massive sculpture is part of the striking garden decor near the main entrance to Tokyo Big Sight, home to JIMTOF. able information to avoid downtime and improve p r o d u c t i v i t y t h r o u g h m o r e t h o r o u g h a n d timely monitoring. The show also indicated that, for machine tool builders, the premier interoperability/data exchange- ability standard is MTConnect, which is apparently being widely adopted to promote shopfloor con- nectivity. MTConnect is described as a set of open, royalty-free standards intended to foster greater interoperability between machines, devices, control systems and software applications. Orig- inally developed in the United States through the Mazak's booth was literally centered around this portrayal of IIoT solutions. All of the machines in the surrounding booth space were actively monitored. Displays included data from machines being monitored in the company's factories in Japan.